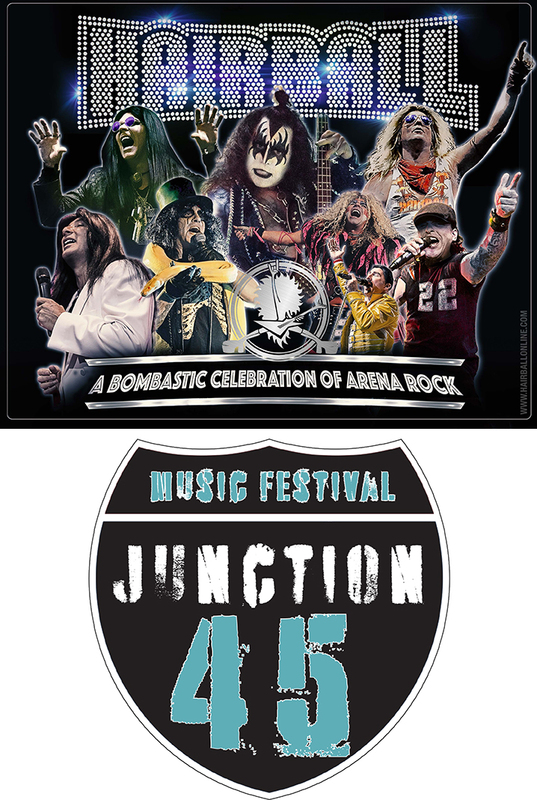 Friday October 19, 2018 – West Bend, WI- The inaugural Junction 45 Music Festival is set to rock Washington County Fair Park on Saturday August 24, 2019 with festival headliner Hairball. 2018 finds Hairball celebrating its 18th year of rocking hundreds of thousands of people across the country. A band puts on a concert - Hairball puts on an event! Hairball is a Rock & Roll experience you won't soon forget. The lights, sound, smoke, fire, bombs, and screaming hordes of avid fans...to merely call it a concert would be like calling Mount Rushmore a roadside attraction! There will be three to four more bands featured at the festival that will be announced soon. Gates will open at 1:00 pm with bands starting between 2:00 and 2:30 pm. Hairball will take the stage at 8:30 pm. Tickets for Junction 45 will go on sale for AIS Members on Monday October 22nd at 8 am and to the public on Friday October 26th at 9 am. Ticket prices start at $15 for general admission lawn seating and range between $25 and $35 for the reserved seating. The reserved seating area has access to their own bathrooms and bars. More information on Junction 45 can be found at www.wcfairpark.com/Junction45. Washington County Fair Park & Conference Center is operated by the Washington County Agricultural & Industrial Society (AIS), a non-profit organization dedicated to enriching life through education, culture, social and economic opportunities. For more information on the organization and how to get involved, visit www.wcfairpark.com. Washington County Fair and MIDWESTIX are the only authorized seller of all Fair tickets. If you purchase a ticket from a ticket broker or third party, Washington County Fair will not guarantee that the ticket(s) are valid; your tickets may be confiscated and you will be denied admission to the event. No re-sale of tickets is permitted via the internet, including but not limited to eBay, Craigslist or any other interactive media except through the official Washington County Fair website.